Farm to school programs are at the vanguard of efforts to create an alternative agrifood system in the United States. Regionally-based, mid-tier food distributors may play an important role in harnessing the potential of farm to school programs to create viable market opportunities for small- and mid-size family farmers, while bringing more locally grown fresh food to school cafeterias. 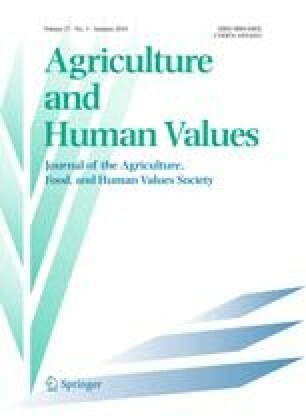 This paper focuses on the perspectives of food distributors. Our findings suggest that the food distributors profiled have the potential to help institutionalize farm to school programs. Notably, their relationships with farmers may be a critical element in expanding the scale and scope of local school food procurement. Their ability to catalyze local school food procurement however, is limited by the structural context in which farm to school programs operate. Specifically, the oppositional school year and agriculture production cycle, and tight food service budget constraints disembed and limit the potential of farm to school programs to decrease the “marketness” of school food procurement and to shift it from a process based largely on price to one that is more territorially embedded. As farm to school programs continue to gain support, regionally-based food distributors that have the meaningful relationships necessary to re-embed the school food service market back into the larger society may be critical to enabling advocates to achieve their goals. This study was supported by the C. S. Mott Group Professor of Sustainable Food Systems at Michigan State University, North Central Sustainable Agriculture Research and Education Program, and Michigan Agricultural Experiment Station. The data for this manuscript is from the dissertation of Betty T. Izumi. The authors would like to thank Gail Feenstra, Daniel Jaffee, Steve Stevenson, Harvey James, and two anonymous reviewers for their invaluable input on this manuscript and the school food service professionals, farmers, and food distributors whose time and energy made this study possible. California Department of Education. n.d. California Fresh Start Pilot Program. http://www.cde.ca.gov/ls/nu/sn/cfsp.asp#what. Accessed 16 April 2008. General Assembly of the State of Colorado. 2006. Fresh Fruits and Vegetables Pilot Program. http://www.state.co.us/gov_dir/leg_dir/olls/sl2006a/sl_242.htm. Accessed 9 May 2008. Gordon Food Service. n.d. http://www.gfs.com. Accessed 13 Feb 2009. Growers Collaborative. n.d. http://www.growerscollaborative.org. Accessed 24 Mar 2008. Li, Y., and S. Saraswat. 2008. Global 500: Our annual ranking of the world’s largest corporations. Fortune Magazine. http://money.cnn.com/magazines/fortune/global500/2008/snapshots/2197.html. Accessed 1 July 2007. National Farm to School Network. n.d. http://www.farmtoschool.org. Accessed 17 Sept 2007. North Carolina Department of Agriculture and Consumer Services. 2008. Farm to School Program. http://www.ncagr.com/fooddist/Farm-to-School.html. Accessed 29 Jan 2008. School Nutrition Association. n.d. http://www.schoolnutrition.org. Accessed 6 Jan 2009. USDA Food and Nutrition Service. 2004. Richard B. Russell National School Lunch Act. http://www.fns.usda.gov/cnd/Governance/Legislation/Historical/NSLA2008.pdf. Accessed 16 April 2008. USDA Food and Nutrition Service. 2008. National School Lunch Program Fact Sheet. http://www.fns.usda.gov/cnd/Lunch/AboutLunch/NSLPFactSheet.pdf. Accessed 13 Nov 2008. USDA Food and Nutrition Service. n.d. Menu Planning in the National School Lunch Program. http://www.fns.usda.gov/cnd/menu/menu.planning.NSLP.htm. Accessed 20 Mar 2009. USDA Food Distribution Programs. n.d. Department of Defense Fresh Fruit and Vegetable Program. http://www.fns.usda.gov/fdd/programs/dod/DoD_FreshFruitandVegetableProgram.pdf. Accessed 16 Nov 2007.